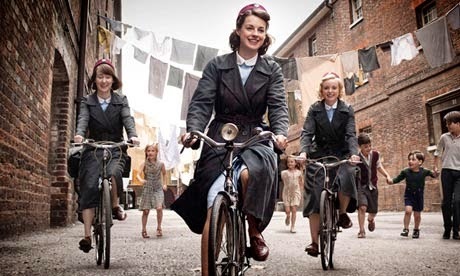 Filming has got underway for the fourth series of BBC1's Call the Midwife. Earlier this year it was announced that Jessica Raine would bow out of lead role Jenny Lee so that got us thinking how this series would be able to continue. Afterall it is narrated by a more mature Jenny in the shape of veteran actress Vanessa Redgrave. Well today the BBC announced that Redgrave will step outside of her narration role and appear on screen during the Christmas Special at the end of the year. Pippa Harris, executive producer for Neal Street Productions said: "We're all delighted to be welcoming Vanessa Redgrave on screen, having hugely enjoyed her narration of the series to date. It's also terrific that Heidi Thomas has created two wonderful new characters for the series, and that we're fortunate enough to have Linda Bassett and Charlotte Ritchie joining our regular and much loved team at Nonnatus House". The fourth series sees the story moving into the swinging sixties and sees the addition of two new cast members. Fresh Meat's Charlotte Ritchie joins the cast as series regular Nurse Barbara Gilbert, whilst Linda Bassett has also joined will also make her first appearance next year. Call the Midwife returns this Christmas on BBC ONE.